From every corner of the United States and other countries too, over a half million people journey annually to Washington DC to March for Life in protest of the January 22, 1973 Roe vs. Wade decision. The face of our nation changed forever when legal abortion became law of the land. Sixty million Americans have been lost to the ultimate disrespect of human life. The March for Life Expo is part of the events surrounding the MFL. The Expo is an opportunity for ministries and services that support life, to meet attendees of The March. 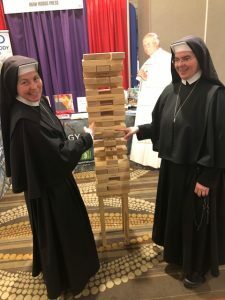 By participating in The Expo, Ruah Woods Press connected with hundreds of people, all in agreement that the inherent dignity of the human person is under attack more than ever. We’ve all read the headlines and stories that confirm our culture of death is grinding stronger than ever. We all know in our own families and communities, the stories where the gendered person, body and soul, created in the image and likeness of God has been re-fashioned into something we may not recognize. We all know the stories of the attack on vocations, marriage and the clergy. The beautiful news is we have a God-given teaching to help reclaim the dignity of the human person. Theology of the Body answers the biggest questions on what it means to be created by Love, to love and for love. TOB explains all the “yesses” of being a man or a woman destined for a God-given vocation. Theology of the Body is an invitation to the culture of LIFE! What is ROOTED created for? 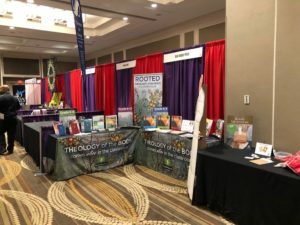 ROOTED: K-12 Theology of the Body curriculum is an outstanding tool to begin teaching the very young that they — and all people — were created with a plan and a purpose. The very young can grasp that just by being human they have ultimate value and worth. Little minds can understand there is design and meaning to every detail in the world. Grade school students can come to know that suffering, sin and transformation are all part of the human condition as a result of the Fall. Children can receive and come to know that making a gift-of-self is the surest way to live most fully and find freedom and happiness. Who wouldn’t want to infuse these truths on all the young people in their lives? 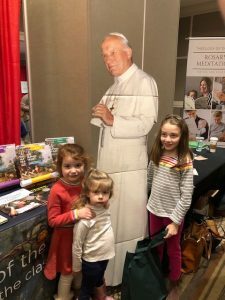 Pope St. John Paul II gave us the way to provide an “adequate anthropology.” Ruah Woods Press has provided a way to bring these age-appropriate teachings to life. Beginning with the very young in kindergarten and bestowing these truths through all four years of high school, truth can be instilled. It was gratifying in many ways to be a part of the March for Life this year. God’s abundance was on full display for us there. Ruah Woods Press is blessed to take part in transforming the culture of death into one of life. We invite you to join us in sharing this most beautiful and faithful gift. We invite you to cultivate a culture of LIFE!